I've had Fusion 360 since it became avaiable and have never been charged a cent. Totally free for us hobby guys. As you know already I have been inspired by your recent work on the very successful Lombard and now the Marion Shovel. Your 3D drawings in Fusion 360 give a great example of what can be achieved with realistic and detailed illustrations of the workings of these rather complex machines. I am still working with my thoughts on Ruston-Bucyrus Shovels which in many ways are similar to Marion's products. It seems that much of the original information on the R-B designs has been lost along with those of Ruston & Hornsby as a result of the takeovers by English Electric and then Siemens, neither of which were likely to have an interest in shovels. However I am still collecting whatever I can find, including various sources which have found their way to the Antipodes. I have been a user of Autodesk Inventor for some time and I want to compare the results from that very expensive programme with your work with the free ( for hobbyists) Fusion 360 which originates from the same software house. 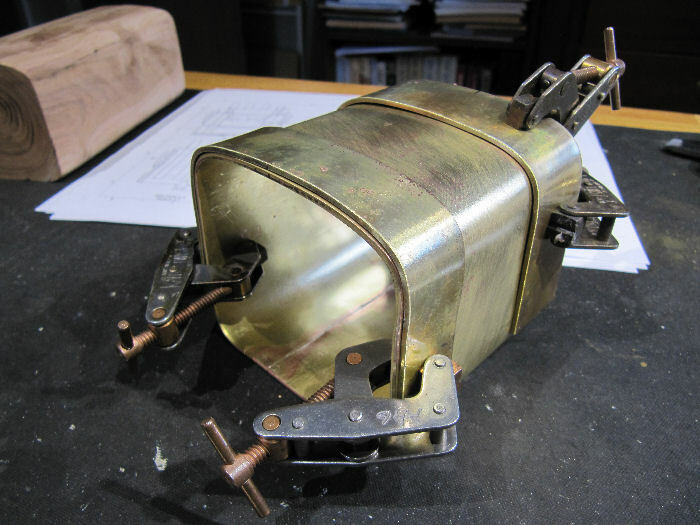 I wonder whether Inventor which has all sorts of bells and whistles but was 'invented' some years ago would perform as well as Fusion 360 which surely must have more up-to-date origins. Sorry to hijack your thread. Not true about fusion. I've been using it for 2 years, no charge. They explicitly state it is free for hobbyist use with no time limit. They no longer even require you to re-register each year. Well even if no real "chips" yes, there is at least some brass sawdust . Nice start on the bucket Chris!! Well, aren't sawdust chips still swarf? They would be off a slitting saw in the mill, right? Some 'real' chips will be made as soon as I start drilling the holes in the parts and mill off the shapes on the end! Wait! There WAS some milling already, making the little clamps for silver soldering! Yes! Cut the strips for the bands around the sides/front, annealed them mand bent into shape using the shell as a form. The last few degrees of the bend were tweaked in using pliers till a good fit was reached. Next I'll start drilling/riveting them in place with some small brass rivets. Don't forget the lemon/sugar christmas cookies! Womped up a batch of those last week... Yum! Yes, great to be spending more time in the shop again rather than at the keyboard! Though I did have to come back to the 3D design briefly, I was setting up to drill the rivet holes, and something just did not look right. Checked the photos of the real bucket again, and realized that I had extended the bands too far down the sides - they should stop a bit before/after the center point at top/bottom. Just corrected that, need to trim the bands now. At least I caught it BEFORE drilling and attaching them! Well, there are yellow, blue, green, and red sugar sprinkles - need something to decorate the confectioners sugar/water topping! I throw more lemon into that topping as well, very tasty! The first batch of rivets are in to hold those two bands on the bucket shell. 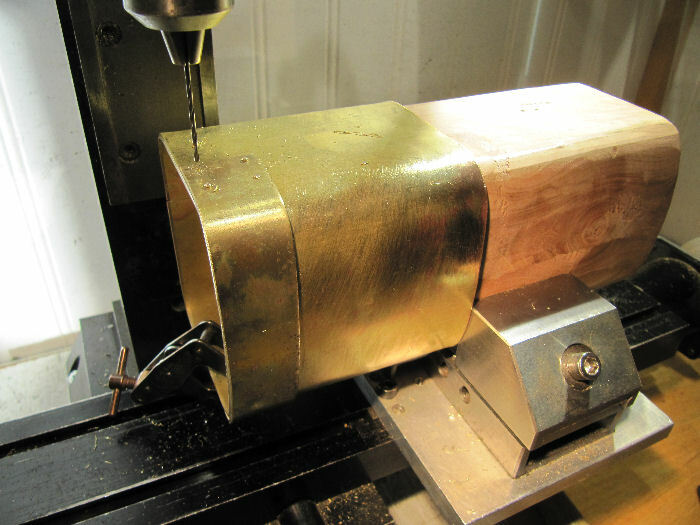 Clamped the bands to the shell, and held the wood form in the mill vise to do the drilling. After the first couple holes were drilled, put in the rivets and removed the clamp so the other holes could be drilled. Same on the other band. 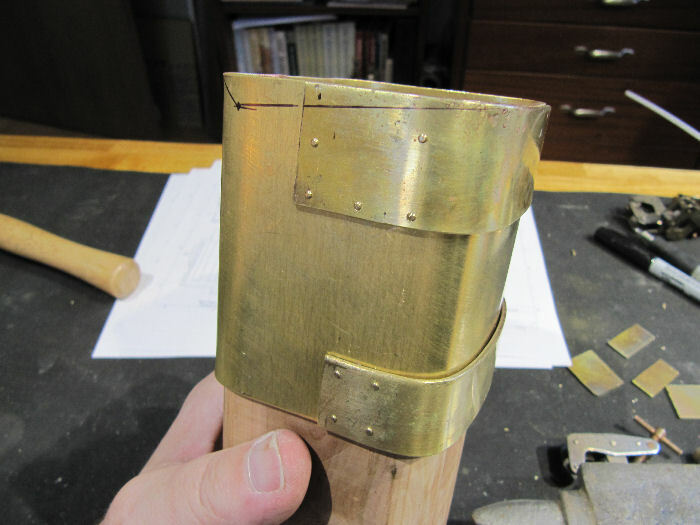 The holes in the top of the upper band are lowered since the top will be milled off at an angle later on. 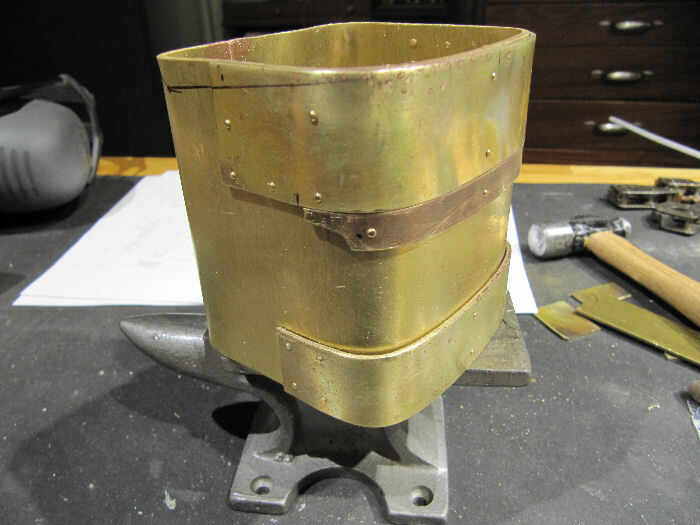 There are no rivets along the front of the bands yet - those will go in with the bases for the teeth are made, since they extend down the inside all the way to the bottom of the bucket. I think they did it that way to both stiffen the front of the bucket, and to keep the teeth from getting twisted from the force of digging. On the model subject: this one looks to be of larger size than the Lombard. On the cookie subject: Grandma Douglas always dusted her Christmas shortbread cookies with raw cane sugar. Under candle light on her dessert table, they had the most wonderful warm glow . The models are a different scale - the Lombard was at 1:12, the Shay and this model are both 1:16 scale. The shovel itself is much larger than the Lombard is in real life though, so the model will be larger. The Lombard is approximately 30' long, the steam shovel is nearly 74' long overall, including the dipper bucket at a medium angle. The Lombard is around 19 tons, the shovel wieghs in at 120 tons! Now I understand what you meant about dusting the cookies, that is different than mine, which have the larger crystal sugars embedded in a hardened frosting layer. Both ways are great! One more bit for the afternoon - put on the strip underneath the top one at the front, that just goes around the corner then ends with a curved section. I thought about making it part of the top bar, but didn't have a wide enough piece so made it in two sections. Some soft solder or JB weld will fair it in and make it look like one piece. The color difference is due the heating to anneal it, going to give it all a dunk in the pickle and a good scouring to clean it all up. Next up is the two vertical bars on the back edge that have the attachment points to the boom, as well as three horizontal bars that tie it all in to the bucket shell. Those horizontal bars will be some fiddly filing work to make them sit flush where they wrap around the back curves. Or, may bend them and file the outside edges down, that may be easier. Enough for one day though!